Remember the Cat book and the Scarf book I created on Blurb? I loved the quality of the book, the size, the paper they use and the easy-to-use design software. And you can send people to the Blurb.com site to buy your book. Or let them page through your book right on your blog. But the price was too high for me to be able to resell the books, which was my original intention. The lowest cost for a 40 page full-color softcover 7.25" square book was $12.95 plus shipping. 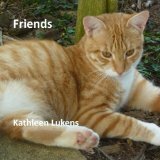 I really wanted to sell the Cat book as a fundraiser for our local Humane Society and their was no way I would be able to sell it even at cost, let alone at a price that would let me generate a little profit for the organization. So I started looking at some other sites that would let me create the identical book at a lower cost. I started searching for POD (print on demand) sites and narrowed it down to a few of the better known sites. Many of them charged about the same price as Blurb.com, so there was no incentive to change to them. Finally I came across Createspace. They are an Amazon company. Their pricing was half the amount that Blurb charged. They provide an ISBN number at no charge, which is required to sell on Amazon and most bookstores, libraries etc. That was the good news. The downside? There is no software to help you design your book. You have to create your own book file and cover file so they look exactly like you want them to look in print, convert them to PDF files and upload them to Createspace for printing. Because of the potential price savings, I looked into design software a bit more and after reading a number of questions and answers on their help forum, I got a 30-day free trial version of Adobe InDesign and set to work duplicating the two books I had already created in Blurb, right down to the cover. Other people use a word processor or other design software. depending on the content of their book. Because I was using mostly photos and not much text, I decided against using a word processor. Adobe InDesign was a bit daunting at first -- it does way more than I'll ever use and I ended up purchasing a "how to use" book to help me get up to speed quickly in creating a file, laying out the pages, embedding photos, etc. Once I got the hang of it, the actual creating went quickly -- I created some master layouts, dropped in the photos, added text where needed and that was it. Once I was happy with the inside of the book, I tackled the cover. Createspace does have software you can use on line to create your cover and it was very easy to use, but I had a specific layout in mind and it wasn't one of the choices. So I ditched the first cover I created and went back to do my own cover using Adobe InDesign. I was able to do exactly what I wanted and the books turned out great! They are virtually identical to the books I created on Blurb, except they are an inch bigger all around. I got my proof copies back today and I was really happy with the quality. I was worried that the photos would not look as good on their paper, but they do. So I'm a happy camper. I now have the option of purchasing copies at $6 something plus shipping. I can also sell my books on Amazon if I want. Or for $39 I can upgrade to a Pro Plan that cuts my price in half ($3 something instead of $6 something per copy), gives you more money on any sales you make at Amazon, and lets you sell to libraries etc. For me, I'm happy just to be able to buy copies at a low enough price that I can resell them at craft fairs or fundraisers for an affordable price. If I were to do it over again, I would probably still go with Blurb.com first. Creating my first book there was a really good way to learn the basics of what is involved. Then if you want to look into other options like I did, you will know more of what you want to be able to do and whether you are ready to go it alone or need to stick with a company that will have software available to help you do the design and layout. Either way, it's been a fun learning experience and I wish I had another book in mind. I'd definitely do it again.